To be sent to The Capital Times, The Wisconsin State Journal, The Capital City Hues, The Madison Times and maybe more (I may do another edit before sending). Click on the links to send your own letter! According to the official September census, the Madison Metropolitan School District serves 24,189 students. The individual and collective futures of these students are the best reasons to vote yes on the November 4 operating referendum. We have an obligation to these students to give them the best opportunities to flourish and to be part making their world a better place than the one we are leaving them. The world we are leaving our children is a mix of good and bad. We are a prosperous community in a prosperous nation, but there is great economic uncertainty and growing deficits and debts at all levels. We have wonderful traditions of self government, but these traditions have been corrupted and our representatives are often ineffective or inattentive. We have ideals of justice and equality that unite us, but are torn apart by divisions and inequality. We think of ourselves as a world leader for peace and freedom, but our devastating mistakes have made us an embattled pariah at a time when cooperation is essential. We need to give the coming generations the tools they need to build on the good and correct the bad. We can do this in many ways, but strong public schools have to part of it. Our community understands this; we value education and know the value of education. Under the broken state finance system, referenda are how we can act on this knowledge to support the quality schools we want and need. Our schools are very good, but far from perfect. Fifteen years of trying to do more with less under a broken system have taken their toll. We can all find things with the schools that we don’t like or think need to be done better, or more, or less. The improvements we demand aren’t going to happen without the resources supplied by the referendum. What will happen are more distracting struggles as the district tries to find the least harmful $13 million to $16 million worth of cuts over the next three years. Dissatisfaction with particulars and desire for improvement aren’t reasons to vote no, they are reasons to vote yes. Just like we need to give those 24,189 students the tools to make the world better, we need to give our schools the resources they need to build on the good and correct the bad. 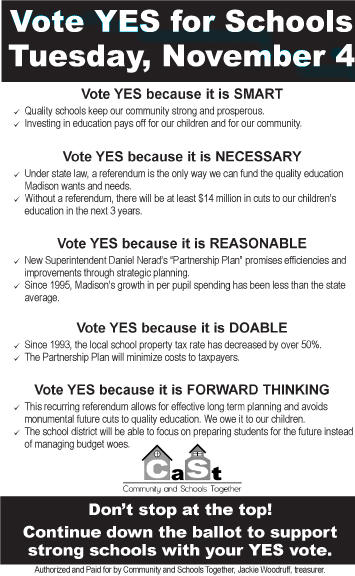 Vote yes for schools, vote yes for a better future, vote yes for the 24,189 children who are depending on your support. “Yes We Can Can,” by Allen Toussaint, as performed by Lee Dorsey (click to listen or download).